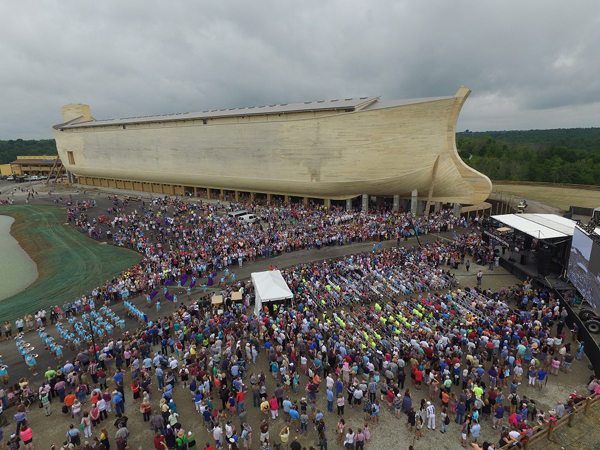 More than 7,000 people reportedly turned out for the opening day of a new $US100 million life-sized version of Noah's Ark in the US last week. Called 'Ark Encounter' and located in Williamstown, Kentucky, the 155 metre-long, 25 metre-wide and seven storey high vessel was built "according to the Biblical dimensions in Genesis 6". Described as the "largest free-standing time-frame building in the world", it opened to the public on 7th July. 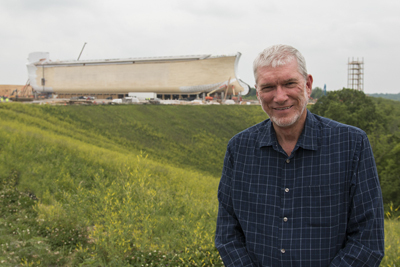 VISION ACCOMPLISHED: Ken Ham and the ark under construction. Top: Crowd gathers for the ribbon cutting ceremony on 5th July. IMAGES: Supplied..
"I believe you're going to find all sorts of people from all walks of life with all sorts of religious backgrounds who are going to come here." Its creator, Australian Ken Ham, CEO of Answers in Genesis and the founder of the Creation Museum - which lies about 64 miles to the north of the 800 acre ark site, said in a statement that research indicated as many as 40 per cent of visitors to the ark are expected to be non-Christians. "I believe you're going to find all sorts of people from all walks of life with all sorts of religious backgrounds who are going to come here," he said. "And even if they don't share our Biblical view, they can't help but be impressed by the structure, craftsmanship and by the attention to detail of the world-class exhibits inside. And who knows? Maybe they'll be challenged to even talk about the Bible." He said the ark was a "reminder" of the "truth of God's Word". "It's our way of presenting this to the world." The ark's measurements were based on the "Hebrew long cubit" and the vessel built in "accordance with sound established nautical engineering practices of the ancient era". As well as the ark itself - which has three levels of exhibits, the Ark Experience theme park includes a zoo, animal and bird shows, zip lines, live entertainment, a restaurant and fair-trade shopping. Further exhibits are expected to be added to the theme park including a wall city, a Tower of Babel, a first century Middle-Eastern village, a "journey in history" spanning the period from Abraham to the parting of the Red Sea, and a walk-through aviary. The total project is expected to cost more than $US150 million. The park will be open until midnight for the first 40 days of its opening.